Balloon sinus dilation, otherwise known as balloon sinuplasty, is one of the most common procedures performed by otolaryngologists (ear, nose, and throat surgeons) today. Its minimally invasive nature, minimal downtime, and excellent results have contributed to its popularity. Who is the ideal candidate for this procedure? How do you know if you have chronic sinusitis? How do you determine if the procedure is right for you? Below are the five most common symptoms that we find in patients who present complaining of sinusitis. Following that you can take a questionnaire to determine if you might be a candidate for balloon sinus dilation. Nasal obstruction continues to be the number one reason patients come into our office. There are four general anatomic structures that we analyze for these patients: Sinuses, Septum, Nasal Valves, and Turbinates. It has been estimated that 30 million Americans suffer from chronic sinusitis. Chronic sinusitis and arthritis are the two most common chronic illnesses in the United States. Nasal blockage can be from obstruction of the outflow tracts of one or more sinuses. Often there are other symptoms that occur with the obstruction, such as facial pressure, facial pain, and headaches. Sometimes, obstruction is the only symptom. In addition to sinus blockage, a deviated nasal septum can contribute to obstruction. Enlargement of the inferior turbinates, bony structures that are located on the side on the nose, is also a frequent culprit, Turbinates get engorged in patients with allergies. Finally, the way the sidewalls of the nose are constructed and relate to the septum and internal structures can contribute to obstruction. The above four potential sites often contribute to obstruction together and must be considered for optimal treatment. Nasal congestion occurs when the mucosal lining of the nose or sinuses becomes swollen. The most common cause of this is environmental allergies, but nonallergic irritants such as strong odors or cigarette smoke may also be the culprit. When this swelling persists, it can block off the channels to the sinuses and lead to congestion, Initial therapy is designed to treat the underlying allergies, reduce the mucosal edema, and hopefully relieve the involved sinus. Chronic sinusitis is always in the differential diagnosis of headaches. Headaches located above the nose and eyebrows are in the region of the two frontal sinuses, Blockage in the outflow tract of the frontal sinuses can lead to quite severe headaches that can be mistaken for migraines. Blockage in the outflow tract of the maxillary (cheek) sinuses can lead to facial pain. This can be mistaken for a dental issue. Blockage in the outflow tract of the sinuses in the very back of the nose (sphenoid sinuses) causes pain in the back of the head, or occipital region. Patients will often relate that the headaches are worse when descending in an airplane or diving. These headaches are often relieved somewhat by a decongestant or hot steamy shower. Steroid nose sprays can be used as well to try to decrease the outflow tract obstruction and thereby relieve the pressure. Nasal drainage is a somewhat general term referring to any fluid discharge from the front of the nose (rhinorrhea) or down the back of the throat (post nasal drip). The most common cause of rhinorrhea or post nasal drip is environmental allergy. Less common is vasomotor rhinitis, which can often mimic rhinorrhea from allergic rhinitis, but is caused by an overactive nerve in the nose. 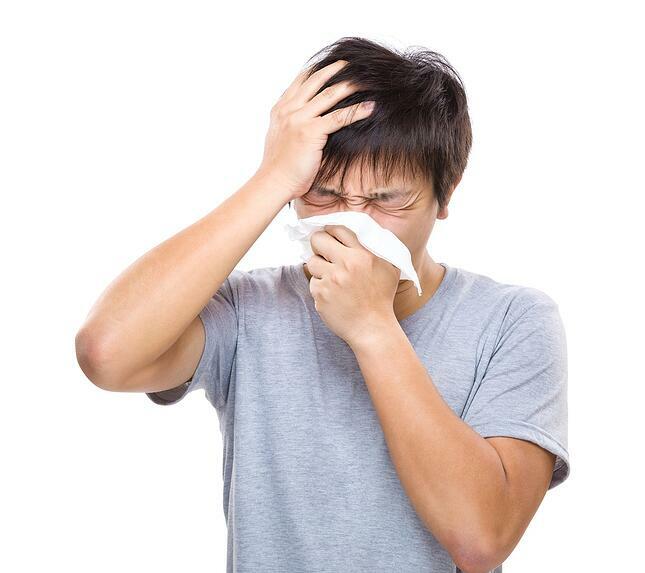 Triggers of vasomotor rhinitis include eating and cold weather. When drainage becomes anything but clear, it can indicate a sinus infection. This is because the normal nasal mucous cannot flow out of the sinuses properly. This stasis of the mucous causes it to thicken and can lead to infection. In addition to the discolored drainage, a sinus infection can cause the symptoms listed above, namely facial pain, headaches, pressure, congestion, and obstruction. Patients frequently present to our office complaining of an endless cycle of experiencing symptoms consistent with the ‘common cold’ which then progress into a full blown sinus infection requiring antibiotics for relief. These cycles repeat themselves, often four or more times a year. We refer to this entity as Recurrent Acute Rhinosinsitis since these patients often feel well between the episodes. Findings on exam and CT scan of the sinuses support this diagnosis. Balloon sinuplasty is a minimally invasive office procedure in which blocked sinuses are unblocked by carefully placing a balloon in the entrance of the sinus, inflating, deflating, then removing the balloon. This process is then repeated for the other involved sinuses. This is a quick procedure (usually less than 30 minutes) and patients return to normal activity within a day or two. Not every patient with symptoms above are candidates. Treatment of chronic sinusitis begins with analysis of the extent and cause of the problem, and continues with medical and allergic management. It is for those patients who have failed appropriate medical and allergic therapy that balloon sinuplasty is recommended. You may take this brief questionnaire to find out if you might be a candidate for balloon sinuplasty. Nathan E. Nachlas, MD is the Medical Director of the Nose and Sinus Institute of Boca Raton, He is a Johns Hopkins trained Otolaryngologist and one of the pioneers of minimally invasive sinus surgery. He is board certified in both otolaryngology and facial plastic and reconstructive surgery. He has been serving South Florida since 1987. For further information, please contact Sandy Friedman, the Director of Patient Relations for the Nose and Sinus Institute of Boca Raton, at (561) 939-0909.
broken nose Surgery - What to Do!? What is Balloon Sinuplasty and Who Benefits from it? © 2016 Nathan E. Nachlas, M.D.